This entry was posted in Short postings and tagged anglicanism, celebration, christianity, denominations, diversity, evangelicalism, methodism. Bookmark the permalink. All churches – with the possible exception of unprogrammed Quakers – use liturgy. Just because they don’t use a more formal or codified liturgy does not mean evangelicals don’t use liturgy! They may not be aware that they are using it and may protest strongly that they are not, but this comes from a misunderstanding of what liturgy is. 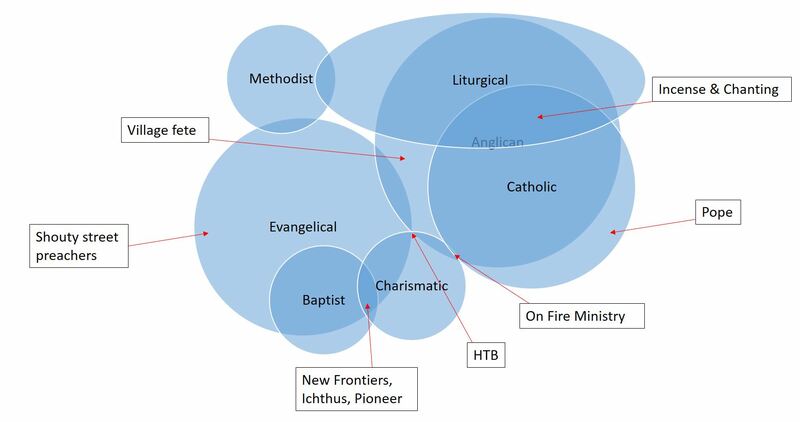 While I agree that celebrating diversity within the church means embracing evangelicalism, be aware that many liberal and/or Catholic Christians have been seriously harmed spiritually and emotionally by some evangelical churches (and often uni CUs too), especially if they are LGBTQ. LGBTQ evangelical organisations are helping with healing here, but it’s going to take a long time. I’ve come across that all-embracing idea that “everything is liturgical” before. The weakness of it is that it’s so dilute it’s virtually meaningless and just a by-word for ‘the way we do things’ which is sometimes worded as “tradition”. If that argument held, then the way I organise my spreadsheets is liturgical because that’s the way I do it. Rather, when one considers the idea of liturgy there are 3 aspects that spring to mind. 1) Scripted services; you get handed a booklet that reads like a short play where everyone has there roles and there’s no room for going off-script and certainly no room for the Holy Spirit. 2) The reworking of John 13:45 as “[By this everyone will know that you are my disciples, that you are colour-coded according to your rank]”. Here a strong desire to separate clergy (and their pecking order) prevails, rather than the idea of a priesthood of all believers, where all are equal. 3) The liturgical calendar. While the first two are neither prescribed nor proscribed in scripture, this 3rd is the only one that crops up in the New Testament (Galatians 4:10,11) where St Paul indicates that observing a liturgical calendar (special seasons) is demonstrative that they haven’t fully understood the gospel. It’s for these reasons that a pro-liturgy church is best described as ecclesiastically conservative, even if it may be liberal in other ways. Of course people hurt one another; I wouldn’t deny that some liberals have been hurt by conservatives and that anglo-catholics have been hurt by evangelicals. Yet the same is true the other way around, and I certainly see a rising tide of suspicion and hatred of evangelicals within the church, sometimes as a retaliation against the many for the sins of the few. Perhaps we all need to be reminded of 1 John 2:7-11. As for the question of LGBTQ people in the church, you probably know that I stand alongside fellow affirming evangelicals, though I don’t make such affirmation a Shibboleth, as I will worship alongside those I disagree with, whether they be homophobes, Tories, creationists, liturgicals, etc. I’ve long had on my mind some qualms, though, about single-issue christians (i.e. those whose primary concern and expression of christianity is about campaigning on one topic. e.g. LGBTQ, environmentalism, sola scriptura, feminism, etc.) but have yet to get it in writing. On this, I think we may disagree, but I hope that that will never be sufficient to prevent communion and fellowship.